KATE MEIKLE, mother of two, offers up a salute to all mums managing their babies. IT might not have a secret handshake, our membership base is broad and diverse, but I reckon that becoming a parent certainly is like entering a club. Life as you know it is now completely different. And guess what? You are now a lifelong member. No-one hands out medals in this club (although Mother’s Day is approaching! ), but the rewards are indeed the greatest. But what’s missing from the club is a “salute” that we all know to use to acknowledge each other. To give your fellow members a nod of comradeship especially when the going gets tough. It would have been good to have the salute when I used to push my pram around the neighbourhood every afternoon in an attempt to settle my crying baby who really needed a nap but resisted his afternoon one every day. To me, the sound of my baby crying was the loudest, most consuming, cold-sweat provoking sound I have ever heard. But I pressed on, plodding the pavement, pushing that pram and “shooshing”. It was all I could do. When I passed people I felt self-conscious about the crying and would say to my baby loudly: “There, there… we’re almost home, darling” even when we weren’t. I hated the idea of someone thinking I wasn’t doing a good job of consoling my baby. That I was a ‘bad’ mum. By the time my second baby came along, and boy was she a screamer, I was more immune to the cries and more comfortable with my role to know that, despite all my best efforts, sometimes babies cry. The salute would come in handy when wrangling small children, when they are tired, you’ve run out of snacks and they are about to crack it, and you just need to know someone gets what you are going through. 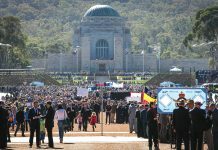 I would have loved the salute when breastfeeding in the most random of places, because babies need milk sometimes in the checkout queue at the supermarket, or in the car while parked in the busy departure drop-off zone at Sydney airport (those security guys were very understanding). This club is a special one, but mercifully it’s non-exclusive. It can feel lonely at times, but you are never alone. There are networks you never knew existed until you join the club. And you don’t have to be in the club to give a little salute or support to a new mum or dad. The kindness, understanding and support I have received has also been from strangers, and those without children. Sometimes a little smile is all it takes to make the job of motherhood that little bit easier and that can come from anyone, and believe me it means the most when you least expect it. 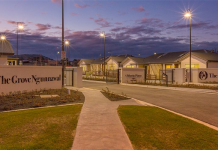 MARKETPLACE Gungahlin is perfect for a family outing, says marketing manager Beth Gooch. 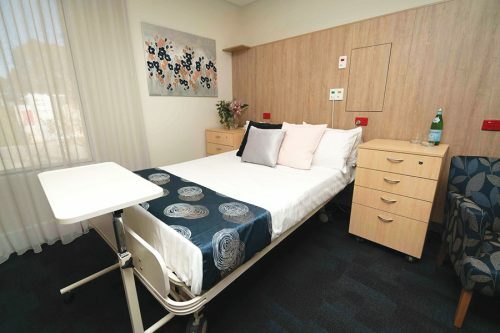 “We have really great facilities for families such as parent rooms, mums and bubs parking, a free indoor playground, plus a lot of cafes, which cater for kids,” she says. 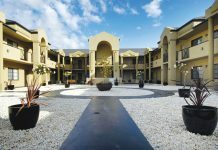 “Lots of them have plenty of room for strollers and some have menus encompassing kids’ dining options and babycinos. Beth says the Marketplace is also a space for fun with plenty of small merry-go-rounds and rides dotted throughout the centre. “It’s really good because when kids get restless they can be distracted on rides,” she says. “We also have a kids club that parents can sign up to online and they will be the first to know about activities and quality, free kids club events. Marketplace Gungahlin also has many kids stores such as Mini Bling and Me, Kmart, BigW and Bookface. “Woolies also has a free fruit station to keep kids busy eating while parents shop,” she says. THIS October the Canberra region of the Australian Breastfeeding Association (ABA) will be celebrating 50 years of providing mother-to-mother support in the community, says ABA breastfeeding counsellor Megan Fox. Run by volunteers who have completed a Certificate IV in breastfeeding education, the association offers a range of national and local services to support families on their breastfeeding journey. “The Canberra group organises regular events and activities across Canberra, Queanbeyan and surrounding areas to bring mothers and their babies or children together,” Megan says. “Partners, grandparents and friends are also welcome at our get togethers. 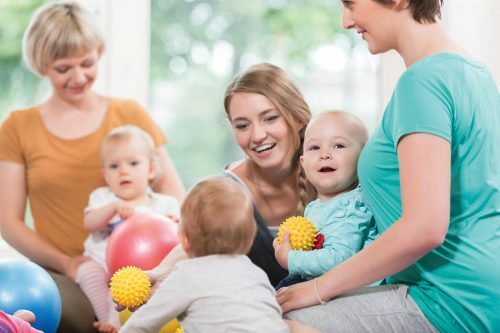 “Our group is a bit different to traditional mothers’ groups as babies and children are usually at various stages, so mothers can benefit from the experience of other mothers and learn from each other. Megan says the Canberra group is a source of friendship, resources and fun for many women. 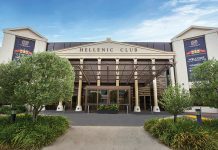 The Canberra group also offers services such as breastfeeding education classes, which are run each month for expectant parents, and breast pump hire. “We have a range of breast pumps and accessories available to hire or buy,” Megan says. Mini golf at Yarralumla Play Station. FOR mums, bubs, dads and older children, Yarralumla Play Station has a variety of activities for kids of all ages, says owner and manager Jason Perkins. 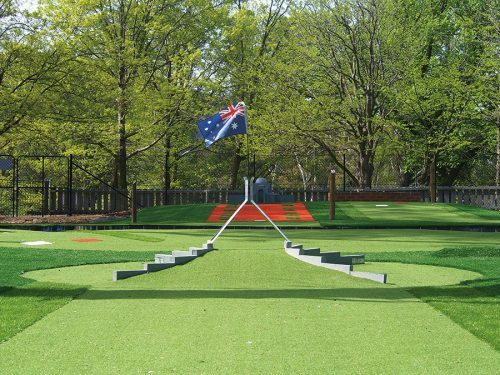 “There is more than enough at the Yarralumla Play Station to keep the whole family amused and make a day of it,” he says. Originally built in 1973, the venue underwent a massive transformation in 2014 when Jason took on ownership and created and built what is now the Yarralumla Play Station. Recent changes have included an extension of what is now known as The Station Stop Cafe, the introduction of two mini golf courses and the restoration of four historic NSW train carriages circa 1910 to be used for functions. Jason says fun activities, such as putt-putting around Canberra’s most famous icons, riding on a mini train and feeding animals at the mini farm, are a huge hit with kids. “We are very family friendly and welcome in parents groups, carers and grandparents,” he says. 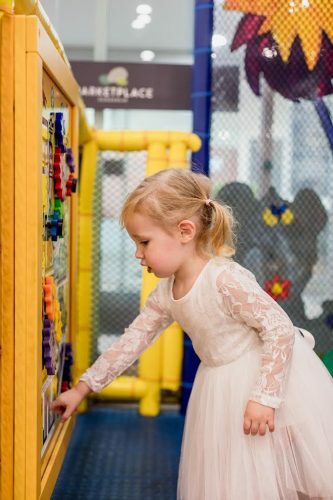 “Our cafe includes a free toddler play area and we have a chef who prepares fresh meals on site at our cafe, with everything from coffee, cakes, burgers – and our kids meals are a hit. SPECIALISING in maternity and newborn photography, Jill Dolby, of LoJo Photography, loves capturing the special bond between a child and their parents. Jill Dolby of LoJo Photography. “It’s about capturing memories but it’s also about capturing the love between parents and their children,” she says. While Jill takes photos of children of all ages, she says her home studio in Amaroo is specifically designed for newborns but she can also organise photoshoots in other locations. She says she takes pride in providing beautiful images, which allow families to keep their memories as they grow and change. “Children change so quickly and memories fade but photos are that thing which will take you back,” she says. Whether that be through digital images, framed photos, portrait boxes with prints, canvas portraits, albums and aluminium prints. Having children of her own helps Jill relate to the needs of a client. “It also helps me to relate to the children in family sessions and when there are older siblings associated with maternity and newborn sessions,” she says. 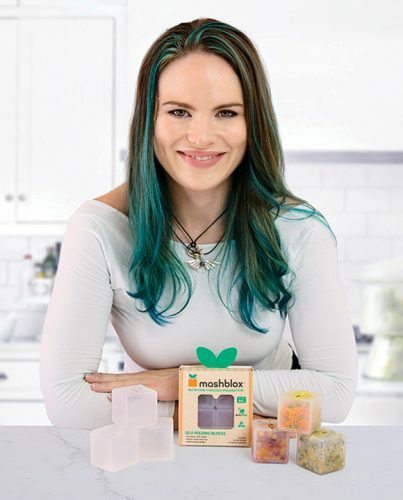 THE inventor, founder and CEO of Mashblox, Alix O’Hara, has been changing the way babies and children eat. Founder of Mashblox Alix O’Hara. Alix established the Canberra-based start-up in 2016 after inventing a hollow silicone building block, which allows children to play with and explore food without making a mess. “The mashed food goes inside and they just squeeze it out through their mouths,” she says. The inspiration for Mashblox came after Alix saw a toddler playing with an apple, which was dropped, bounced and then picked up before being eaten again. “Babies love to play and explore the world through their mouths,” she says. “Mashblox simply applies these instincts in a fun and practical way for bubs to feed themselves. “It’s important to give them the opportunity to playfully feed themselves. “It’s important because they’re able to regulate how much they eat to their own body rather than relying on their parents’ cues. When children are able to feed themselves, Alix says she’s also found it encourages them to eat food they might otherwise be fussy towards. “It encourages children to eat foods that they’ve never touched before such as porridge, fresh bananas, avocados and even peas and spinach,” she says. 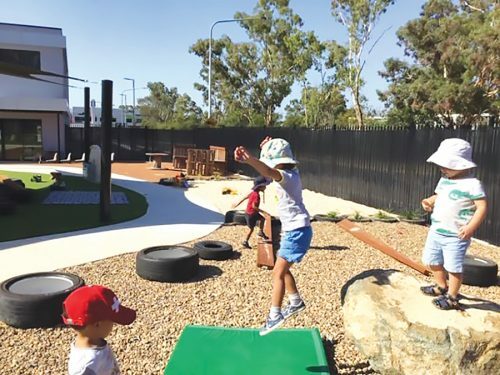 SNOW Gum Early Childhood Learning Centre understands the importance of both male and female role models in early childhood, which is why the centre has both men and women educators, says owner Debbi Lette. “There are males in other aspects of children’s lives so they should also have male role models within childcare too,” she says. Debbi believes that having Joe, the centre’s lead educator in the preschool room, is a huge advantage as it encourages different approaches to learning and play, and provides a positive balance for children. But that isn’t the only advantage of the centre and Debbi says it provides large open learning spaces for a small grouped number of children in each room, which she says allows for stronger relationships to grow. “Our large natural outdoor environment allows each child to take supervised, calculated risks, which is important for social development and inquiry-based learning,” she says. “We ensure we use STEAM (science, technology, engineering, arts and mathematics) teaching and learning opportunities into our preschool program to help our children develop their skills to think scientifically and logically, problem-solve and collaborate. CALVARY John James Hospital has been providing excellent services with great patient outcomes to pregnant women and parents since 1994, says director of clinical services Jo Mitchell. Offering a continuity of care, the hospital has services helping mums through all stages of pregnancy such as antenatal care, through to the delivery and postnatal care. “You choose your obstetrician, who cares for you from early pregnancy, through your pregnancy, labour and post-delivery,” she says. “Our mums link in with our team of midwives during their pregnancy through the antenatal classes (run onsite at the hospital) and then our midwives care for them during labour and following delivery in conjunction with the obstetrician. Jo says it’s about being comfortable while getting high-level medical support with many great reasons to stay in the unit such as partners are welcome to stay, freshly cooked meals, 24-hour onsite doctor and emergency cover and a special care nursery located in the maternity wing. “We provide a lactation specialist for mums to see post delivery and we also offer mums and bubs physiotherapy exercises,” she says. Janet Gerrard of Moments Photography Canberra. 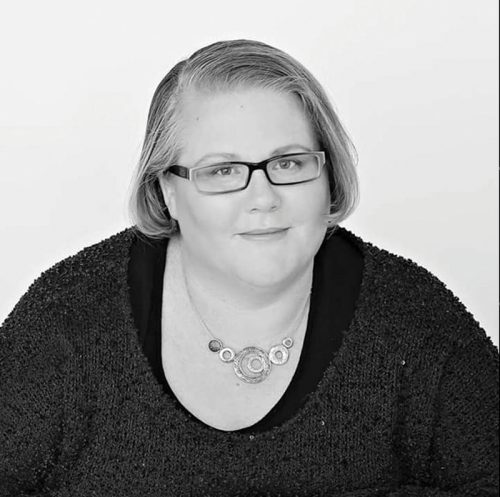 PHOTOGRAPHER Janet Gerrard established Moments Photography Canberra in 2013 and has since built one of Canberra’s best family, newborn and maternity studios in Macgregor. 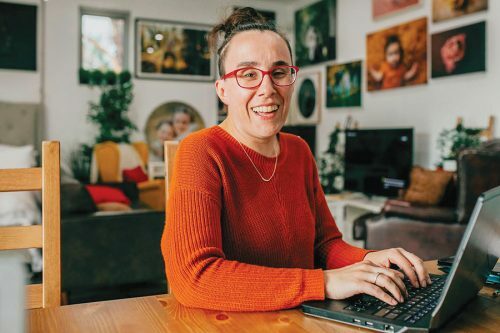 She also says she’s one of Canberra’s best maternity and newborn photographers and, as a mother herself, attributes it to understanding how precious it is to capture memories of family. “I picked up the camera because I was wanting to make sure to capture my growing family,” she says. “I quickly realised how tough it was to do so, and poured my heart into improving my craft. 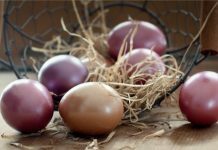 Janet says she’s also a full-service photographer, which means she provides not only digital images but tangible, heirloom-quality products from the finest professional photography labs in Australia. “The photos I capture for my clients become some of their most precious possessions and show how much they are loved,” she says. Janet says it’s an honour to take photos of a mum-to-be and then when she returns to the studio to capture her with her new baby. WHETHER it’s before, during or after pregnancy, CARM Therapies’ remedial massage and acupuncture practitioners have post-graduate training in specific treatments, which are safe and effective, says founder and co-director Emily Avery. Emily Avery of CARM Therapies. “Acupuncture can seem like a scary concept to some people, but the pregnancy acupuncture points used at CARM Therapies are both safe and proven to be effective,” Emily says. Emily says both acupuncture and remedial massage treatments are great for women preparing for pregnancy, for women receiving IVF treatments, for general relaxation, or for musculoskeletal problems such as hip and back pain, which often arise during pregnancy. “Acupuncture is also very beneficial for treating nausea (morning sickness), and massage can help to ease fluid retention,” she says. CARM Therapies also offers one on one sessions for partners to learn how to do acupressure for labour. “This is a one hour session where the expectant mum and her birthing partner learn the best acupressure points to use in the weeks leading up to the due date and during labour,” she says. But no matter what treatment someone needs, Emily says CARM Therapies’ staff are both friendly and professional and understand that each person is unique in their pain experience.